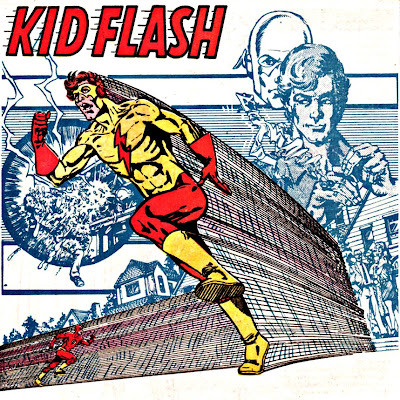 Left and Write: K: Kid Flash! Created by John Broome and Carmine Infantino, Kid Flash debuted in Flash #119 (1959) as a sidekick to the fastest man alive...The Flash. The costume was, originally, worn by Wally West (later by Bart Allen)...the nephew of Barry (The Flash) Allen. Wally gained his powers in the exact same way that Barry did, which defied almost all logic. I mean, you can almost believe that a lightning bolt smashes through a window, shattering a wall full of chemicals, and dousing a police lab scientist....giving him super-speed. But, to have it happen twice?? I'm not sure if they were just being lazy on the origin stories here, or what, but that's what they went with. They're the ones getting paid, so what do I know? Anywho, Wally has been a staple in the D.C. Universe for many years whether it be on his own or as a member of the sidekick group, The Teen Titans. 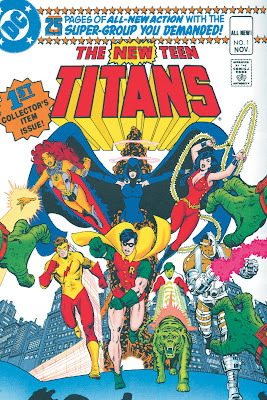 The New Teen Titans, by Marv Wolfman and George Perez was a series instrumental in developing the character deeper than he had ever been developed before. It was here where he revealed his identity to his parents (before that, only Barry knew his secret), fell in love, and decided he wanted a "normal" life. Yes, he was one of 'those' sort of super heroes. He could, almost, outrun light...and yet wanted the big house and white picket fences of suburbia, like his parents. Wally's powers were, pretty much, identical to his mentor, the Flash. He could run at superspeed by tapping into the "Speed Force". This force also lets him vibrate his atoms to allow him to do such things as walk through solid object, run on water and up the sides of buildings, and create mini vortexes with his arms and hands. Also, like his mentor, when he runs he is surrounded by an aura that protects him from friction and lets him breathe. Later on in Wally's career (come on, you didn't think he was really going to have a 'normal' life...did you? ), after taking up the mantle of his dead friend and mentor, he becomes just 'The Flash' and begins to mainline the "Speed Force" instead of just tapping into it. His powers grow to not just include himself, but he could give others superspeed. He also manages to marry and have two children....both of which exhibit his speedy tendencies. While I was never a huge fan of Kid Flash, I did like him within the Teen Titans dynamic where he was characterized as the 'wholesome kid from the Leave it to Beaver family'. A characterization that didn't quite follow him to other books. History of comics! I think you do very well. I know Kid Flash from the Cartoon Network Teen Titans. He liked a teen super villain named Jinx. 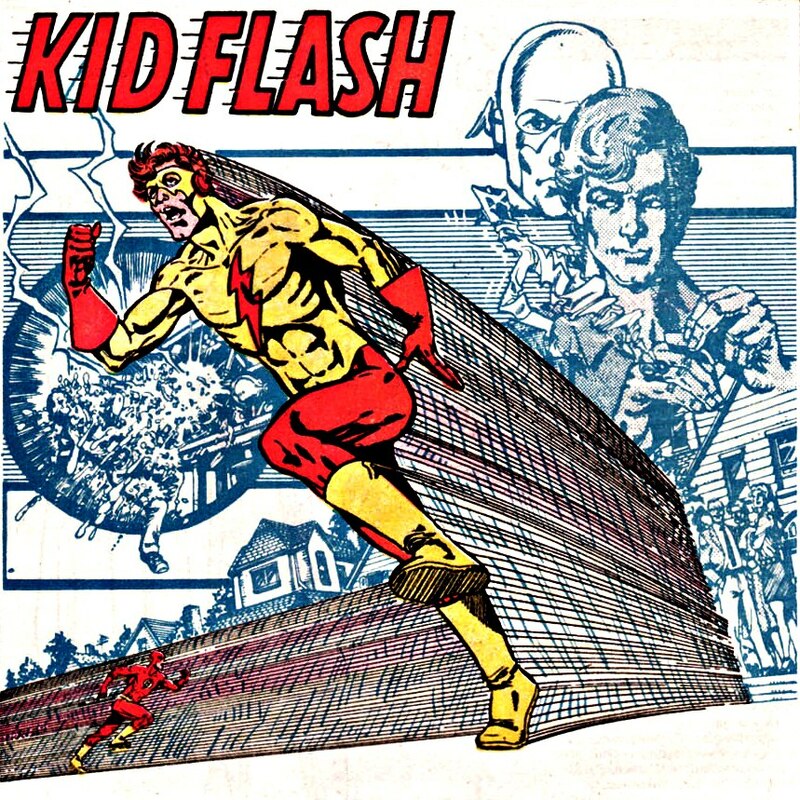 Enjoyed this post on the original Kid Flash. Excellent work Mark. Hi Mark ... I just love seeing all the covers - as I know nothing about the story line ... but the designs and ability to project out - just amazes me .. Cool series, Mark. I used to be a comic book junkie when I was younger (wish I still had some of those issues). I liked the more "childish" ones...Richie Rich, Archie, Thor, The Justice League. I still have boxes of Teen Titans comics! Was always a favorite. A lightening twice in the same place under the same conditions with the same consequences. Why am I grinning so broadly? @Sheena: Thanks! I never got a chance to follow the new cartoon, so I'm curious as to how Wally was portrayed. @Hilary: Totally agree....a lot of times, the cover was the best part of some books! I loved the genetic predisposition to speed! How do those superheroes bear up under all the pressure to outdo everyone all the time? Amazing. Guess that's why they're SUPER. The cartoon Teen Titans got a lot of play over here at the Bird's Nest. I remember the Teen Titans and Kid Flash. I didn't know his history though. Once again you've struck pay dirt!! Good job! I had very little exposure to this character, but found him very endearing in the recent cartoon. The Flash Family is way bigger than I thought! I sort of remember Kid Flash but I didn't know how he got his powers. You're right, that was really a lazy explanation. I must have lied when I said I never read comics because I do remember reading the Flash, although I never heard of kid Flash. I remember reading some comics at my aunts house. They had boys. Lesser known than Kid Flash? I can't wait to see who that might be! You rarely hear about superheroes having families. I imagine it would be difficult to do in their profession. I loved all your info on Kid Flash -- but when did they kill off The Flash?! I'm shocked. I thought they never killed off super-heroes. So, what did they call Bart Allen? I know that Bart was the kid that showed up in Smallville on the TV show, and I just thought he was The Flash. Now, I see that I was wrong about that, since Barry was The Flash... the uncle. I am soooo confused. Odd that the origin stories would be identical like that. I guess they figured it was popular! I've never heard about most of those ten heroes. I did like The Flash though. This is a new one for me. I'm bummed I missed out on the Teen Titans tv series. I have a feeling I would have liked it. Oh I remember the Teen Titans but I'm totally drawing a blank on this guy. ooh - Teen Titans!!! I loved the show they did on CN a while back, and enjoyed seeing that group of teen superheroes in action. Kid Flash was cool in that. I can't believe they made a character who gained their powers in the exact same way another superhero did. They must have thought that they were onto a big thing here and thought it worth the risk. He's an interesting sounding character though, considering he actually managed to have a life outside of hero work. Maybe i'm very ignorant (actually I am very ignorant) but not many of the superheroes I know have managed that. This post reminds me of my younger years. I loved the superheroes then. Well, now I know they're not for real, so I don't like them anymore. Darn! Cool! Creating vortexes with your arms is outta sight! @Manzanita: I'm not sure how often KF was highlighted, so it's plausible you could have just missed him. @Elizabeth: He was pretty well a 'lesser known' hero for a good while. @Diane: True, but there are more than you might think. @Robin: In the comics Bart became the new Kid Flash, then went on to be called "Impulse". It's sort of confusing then they try to bring that stuff into t.v. and movies. They usually wind up changing something. @Susan: Yeah, I a lot of them didn't get much air time. @Elise: If you like anime', you might have enjoyed it. You may be able to find some episodes online, as well. @Julie: heh, I always liked his name too. @Imogen: They managed to give him a pretty decent backstory and make him an interesting character. Not one dimensional, at all. @PK: I know...I always thought that was a cool application of a superspeed power! Well, that makes sense now, because they did call him "Impulse" on Smallville. So he was Kid Flash and not the kid who grew up to be The Flash as I thought. I learn something new every day here.